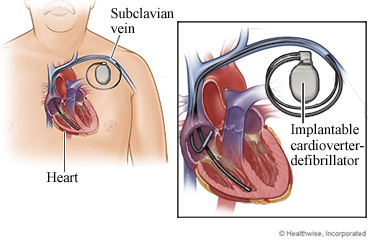 Implantable cardioverter-defibrillator (ICD) placement is surgery to put an ICD in your chest. An ICD is a small, battery-powered device that fixes life-threatening changes in your heartbeat. If the ICD detects a life-threatening rapid heart rhythm, it tries to slow the rhythm to get it back to normal. If the dangerous rhythm does not stop, the ICD sends an electric shock to the heart to restore a normal rhythm. The device then goes back to its watchful mode. Your chest may be sore where the doctor made the cut (incision) and put in the ICD. You also may have a bruise and mild swelling. These symptoms usually get better in 1 to 2 weeks. You may feel a hard ridge along the incision. This usually gets softer in the months after surgery. You probably will be able to see and feel the outline of the ICD under your skin. You will probably be able to go back to work or your usual routine 1 to 2 weeks after surgery. Your doctor will talk to you about how often you will need to have the ICD checked. When you have an ICD, it is important to avoid electrical devices that can stop your ICD from working right. Check with your doctor about what you need to stay away from, what you need to use with care, and what is okay to use. You will need to stay away from things with strong magnetic and electrical fields such as MRI machines (unless your ICD is safe for an MRI), welding equipment, and power generators. You can use a cell phone, but keep it at least 15 centimetres away from your ICD. You can safely use most household and office electronics. These include kitchen appliances, electric power tools, and computers. Avoid activities that strain your chest or upper arm muscles. This includes pushing a lawn mower or vacuum, mopping floors, swimming, or swinging a golf club or tennis racquet. Do not raise your arm, on the side of your body where the ICD is located, above shoulder level. Avoid strenuous activities, such as bicycle riding, jogging, weight lifting, or heavy aerobic exercise. Avoid lifting anything that would make you strain. This may include heavy grocery bags and milk containers, a heavy briefcase or backpack, cat litter or dog food bags, or a child. You will probably need to take about 1 to 2 weeks off from work. It depends on the type of work you do and how you feel. Ask your doctor when you can shower or take a bath. Wash the area daily with warm, soapy water, and pat it dry. Don't use hydrogen peroxide or alcohol, which can slow healing. You may cover the area with a gauze bandage if it weeps or rubs against clothing. Check with your doctor before you start an exercise program. Your doctor may recommend that you work with a physiotherapist to learn how to exercise safely with an ICD. Carry your ICD identification card with you at all times. The card should include the ICD manufacturer and model information. Wear medical alert jewellery that states you have an ICD. Have your ICD checked as often as your doctor recommends. In some cases, this may be done over the phone or the Internet. Your doctor will give you instructions about how to do this. Talk with your doctor about the possibility of turning off the ICD at the end of life. You can put your wishes about the ICD in an advance care plan. You receive a shock from your ICD. You hear an alarm or feel a vibration from your ICD. Enter K184 in the search box to learn more about "Implantable Cardioverter-Defibrillator Placement: What to Expect at Home".